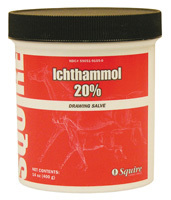 Ichthammol 20% Drawing Salve from Neogen. Apply as ointment to weak or brittle hooves and nails of horses and dogs. Ichthamol can also be used as skin antiseptic to promote healing of minor skin abrasions and inflammation to soothe and soften areas of skin irritation. Loose bandage may be applied.